When we lost our dog Homer suddenly 3 1/2 years ago, I ended up talking with an animal communicator for the first time and it was a very cool and healing experience. I talk about that much more in my book, Homer the Hound Dog’s Guide to Happiness: 6 Life Lessons I Learned From My Dog. Six months after Homer passed I saw a video online from the Sterling Animal Shelter, where we had gotten Homer and my wife volunteered at, featuring a 3 legged dog named Sadie. 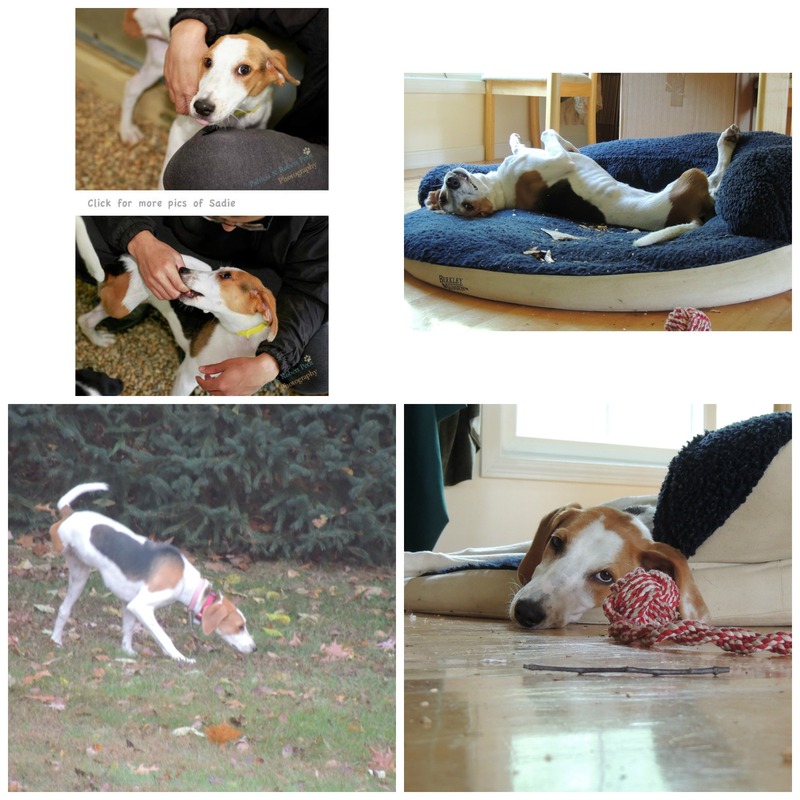 I saw Sadie bouncing around, playing; the very embodiment of resilience and joy. I immediately text my wife and said I’ve found our next dog. We’ve had Sadie for 3 years now and in recent months she’s started a new thing of staying outside very late. I’m talking until 1am even 2am and beyond on some occasions. We live in a rural, wooded area with turkey, deer, coyote and even more critters. Sadie will go outside on her own (we have an invisible dog fence) around 8 or 9pm and sometimes stay out. I’ll see her at 11pm and midnight sitting in the backyard survey everything. We’ll call her to come inside and she looks right at us and runs away. Often on these nights we’ll hear coyotes and Sadie stays outside, as if on patrol. When I tuned into her energetically, I’d get that she’s protecting us. She thinks she’s standing guard for us to keep the coyotes away or when they come into the yard she (thankfully!) runs to the front door, sometimes slamming into it, to sound the alarm, or say “let me in!” I’d been wanting to somehow tell her we don’t need or want her to stay out all night. Coincidentally, I recently met Diana van Trijffel-Pak an animal communicator, and it dawned on me to ask her about Sadie. Let me back up a bit, in my first encounter with Diana I didn’t know she was an animal communicator. She came to me for an Akashic Records Reading. When I opened her records it was like I’d stepped on to Noah’s Ark – that is how I discovered she was an animal communicator! So, I decided to ask Diana to give Sadie a reading and inquire about these long nights outside. Turns out my intuition was right. Sadie is out there protecting us, consciously choosing to do so. The new information – which moved me to tears – is that Sadie does hear my requests for her to stop, but she refuses to. We rescued her and she feels obligated to rescue us now. Cue the dog-loving water works 🙂 I love my crazy three-legged protection. Here is the full message we got from Sadie thru Diana. When I tune into her I get a feeling of unsafe. Need for protection. When actually contacting her: Tension in her body. Her home. Nobody touches me or my family. Have to be strong! Even stronger than my four legged family members. She is funny. Like this child who is like: I can do this. Watch me. Kid in superman cloak. HaHaaaa…., here I come! Superwoman in this case. Protecting land and home. Those pesky doglike things out there. Coyotes you call them? They are like chickens. Hahaaaa! The only thing is they sometimes come in pairs of groups. That’s tricky. But usually I just do my superwoman act and they are off. Hahaaa! I tell her you don’t want her to do that. But, but. I have to protect right? Like they saved and rescued me. Protected me. Want to do something in return. She is not very willing to let this go. Suddenly she asks if you could also do that Akashic thing for her. I tell her that I don’t know, if they are done for animals. I suppose it could be done. I tell her to pass on the request. She really, really, really loves living with you. Feeling so loved and accepted. I do feel a little discomfort in her lower back. Maybe a compensation thing going on. Could have her checked out by an osteopath or any other animal therapist every now and then. Massages/Reiki/Cranial, things like that. Acupuncture maybe even. She doesn’t miss her leg at all, but it could be having an effect on her physique. She is still young so if you start with that now she will benefit from it as she gets older. Yes, she is amazing! 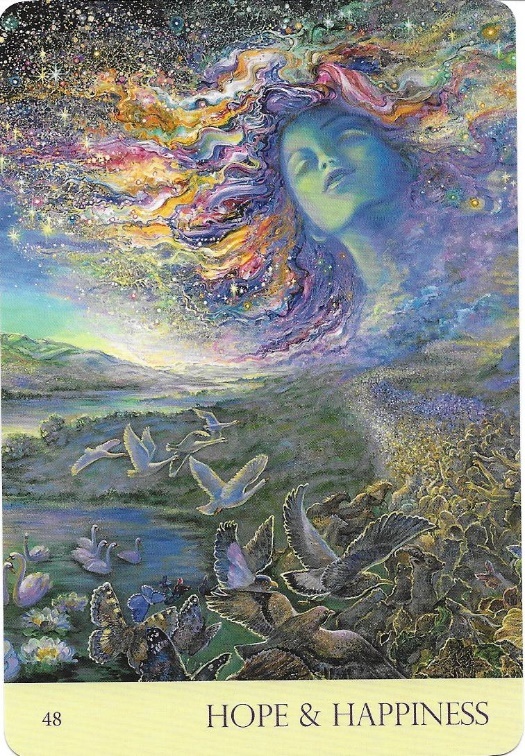 And I can open Akashic Records of animals – someone even asked me about this today! I’ve been hesitant to do so because unlike with a human there isn’t a way to get any validation (at least that is my assumption). I’ll make an attempt soon and share what happens. Oh, if you follow me on my Facebook Page or Instagram you’ll see I pull a card each morning to share with the world. Seems Sadie likes that too. Here is more from Diana/Sadie. Sadie actually wanted a card for herself and she picked one for you. For herself from the Wild Earth Animal Essences and for you from the Nature’s Whispers set. 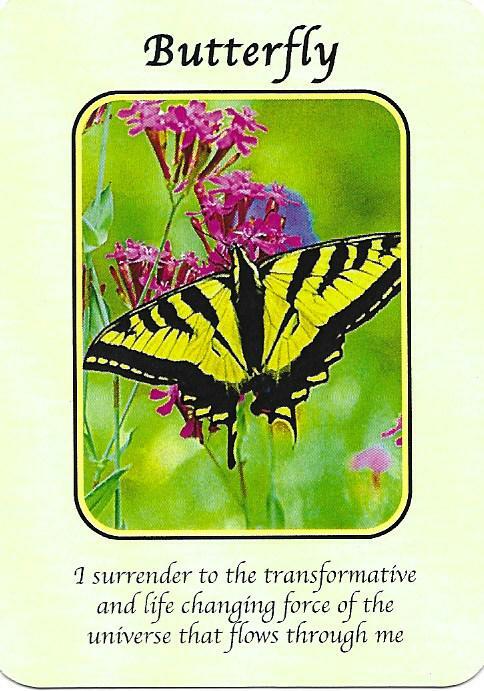 Butterfly: I surrender to the transformative and life changing force of the universe that flows through me. As a catalyst for transformation, supports one in times of emotional and spiritual transition. For letting go, moving forward and trusting in the wind’s ability to carry one. Encourages feelings of lightness, grace and a gentle fluidity in giving and receiving. Nurtures a harmonious balance of vulnerability and strength within the self. You have reached a time filled with healing energy, new progress and satisfaction. You are at a point for festivity. The energy in this phase is supportive and promotes a feel of “winning”. Let worries and challenges from the past fade away as you focus on the joy that is surrounding you. Feel encouraged and excited about the potential of all of the wonderful promises that are being kept. Celebrate and enjoy your life. If you’ve got a furry friend you need to talk to, check out Diana at heart-messages.com/. Tell her Sadie sent you. What a cool post, I am a big fan of animal communicators for animals that have passed and ones that are alive as well. It’s an amazing experience. Many resources out there as well, right now I am reading Dog Only Knows by Terry Kaye and it’s magnificent. Short read, but very good. Her site is dogonlyknows.com and she is so clever and her communication with her dog is quite endearing and humorous. Leave a comment for: "Communicating with Sadie"